If you’ve used a Mac or iTunes at all, you’ve probably come across the Cover Flow view. This shows you a series of album covers, photos, or other documents in 3D, allowing you to flip between them by clicking them, dragging a scrollbar, or using the arrow keys. The code uses quite a few CSS properties of the WebKit browser engine, and currently it only works in Safari on Mac and Windows, and Mobile Safari on iOS (iPhone, iPod touch and iPad). It should theoretically work in Chrome too, but Chrome’s handling of rotateY() seems to be broken at the time of writing. So you’ll need to view the demo on Safari for now. Such is life. I hope that one day I can extend the demo to work in other browsers once they support the relevant CSS3 features. In this tutorial I’ll explain how I created the Cover Flow gallery demo. Along the way we’ll explore many of WebKit’s powerful CSS features, and look at various techniques for positioning and animating objects in 3D. I hope you enjoy reading it! 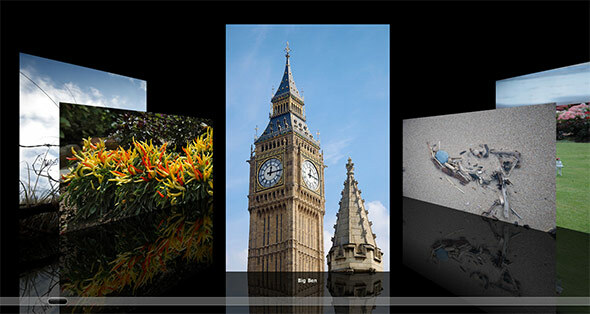 CSS 3D transforms let us position and rotate the slide images in 3D space. WebKit handles the projection onto the 2D page automatically. CSS transitions let us animate the slides’ movement automatically. All we need to do is add a transition, specify a new position and angle for each slide using 3D transforms, and the browser smoothly transitions the slide from the old to the new position. By adding a sharp cubic bezier curve function to the transition, we can make it start very quickly and ease out very slowly, just like the real Cover Flow. 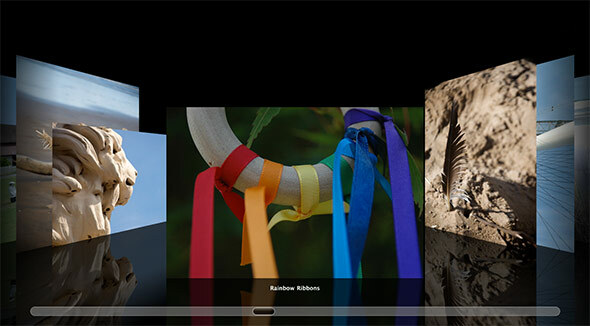 CSS reflections make it easy to add a reflection below each slide image. HTML5 sliders combined with various WebKit-specific CSS properties and shadow DOM pseudo-elements let us create a custom “scrollbar” much like the original. Grab the slide images in the document. Wrap a div around each image to contain both the image and reflection, and to isolate the reflection from the ones behind it. Position each slide div in 3D space according to its position in the list. The current slide faces forward, at the front of the 3D space. All slides to the left and right of the current slide are moved slightly backward “into” the screen so they sit in the background, and rotated slightly clockwise or counter-clockwise as appropriate. Add a click handler to each slide div that makes that slide the new current slide. Once we have a new current slide, we simply update all the slide positions in 3D space, and let the CSS transition move the slides gradually from their old to their new positions. Similarly, add a change handler to the slider so that the current slide is updated when the slider is moved. Also add a keydown handler to allow the user to change the current slide with the left and right arrow keys. We’ll also use a plugin that detects swipe gestures, so mobile users can navigate the gallery using swipe gestures. Add a resize handler to the window that redraws the gallery when the user resizes the browser. This ensures that the current slide remains centred, and the images scale appropriately to fill the window height. To see the full commented code all in one place, you can either view the demo then view the page source, or download the code using the button at the top of the article. A #gallery div holding the slide images. Each image has alt text which we’ll use for its caption. A range slider that the user can drag to move between images. A div containing a loading message. There’s quite a lot of CSS in the page, some of which isn’t relevant to the Cover Flow effect. I’ll just include the relevant stuff here. We make the container fill the entire width and height of the browser. (You can adjust the width and height values to make a smaller, in-page gallery if you prefer.) We also set overflow: hidden so that images outside the gallery div don’t cause a browser scrollbar to appear. If you look at Apple’s Cover Flow, the images fade out towards the left and right side of the screen. We could do this by messing about with the opacities of the individual slides, but a “quick and dirty” approach is to use the -webkit-mask-image property. This lets us overlay an alpha mask onto our gallery. We specify a gradient rather than an actual image. The gradient starts with an opacity of 0.2 on the left side, fades in to an opacity of 1 shortly after, then fades back to 0.2 towards the far right of the gallery. This creates a subtle masking effect, fading out the images on the extreme left and right sides of the gallery. We give each slide image a reflection using -webkit-box-reflect. We add a gradient mask to make the reflection semitransparent, and fade it out slightly towards the bottom. Finally, we hide the images while they’re loading by using display: none. The semitransparent reflections are lovely, but there’s one problem: Since an image’s reflection is semitransparent, the reflections from images behind the current image show through, creating a mess of merged reflections. The original Cover Flow has a translucent scrollbar beneath the images that you can drag to move between images. We can recreate this scrollbar using the HTML5 <input type="range"> slider control. We customize the look of this control fairly heavily using CSS. First we place the slider at the bottom of the window, and centre it using equal left and right properties. We then use the -webkit-appearance: none rule to remove the default browser styling for range inputs. This allows us to style the input, giving it a curved border, light grey background and 50% opacity. We also hide the slider initially while the gallery loads. The ::-webkit-slider-thumb pseudo-element lets us style the thumb control on the slider. Normally this can’t be styled as it’s in the shadow DOM, but WebKit handily lets us style it using this pseudo-element. We give it a fixed with and height, as well as a curved border and a subtle gradient background. The end effect isn’t identical to the original Cover Flow scrollbar, but it’s close enough. The caption is easy. We position it just below the current image, centre it horizontally, and give it a bold Lucida Grande font, as used in the original Apple version. This is the “Please wait…” text that appears while the gallery loads. We position it in the centre of the window, and style and colour the text nicely. We set its opacity to zero initially to hide it. First we load the jQuery library, as well as the jQuery Swipe plugin. This plugin lets us detect swipe gestures on mobile devices. jQuery Swipe isn’t available on a CDN, so you’ll need to download it, then put the jquery.jswipe-0.1.2.js file in the same folder as your gallery page. Next, we add various configuration options for things like the loading message, the angle at which to rotate background slides, the gap between each slide, and the padding either side of the current slide. If you want to tweak any of the values, the comments in the code should give you all the info you need. This will hold the index of the slide that was previously the current slide before the user moved to the new slide. We’ll use this value to detect if a background slide has swapped from the left to the right side, or vice-versa. The number of slides in the gallery. We’ll populate this value once all the images have loaded. This array will hold the IDs for some timers that we’ll create in the displayGallery() function later. We store the IDs so we can clear the timeouts whenever the gallery is redisplayed. We now add a delay to the “Please wait…” loading message (2 seconds by default). If the gallery hasn’t loaded by this point, we start pulsing the loading message by calling the fadeInLoadingMessage() function (of which more later). init() does all the things needed to set up the gallery. Then, once everything’s in place, it displays the gallery. // the swipeLeft and swipeRight events respectively. We start by initializing 2 variables: totalSlides, which holds the total number of slides in the gallery (determined by using the jQuery length property), and pos, which will hold the index number of the slide we’re currently processing. Next we kill any fading animations on the loading message, fade it out using fadeTo(), and remove it from the DOM. We then fade the slider input in using fadeIn(). However, since iOS doesn’t (yet) support sliders fully, we don’t show the slider on iOS devices. The code then loops through each image in the gallery using the each() method. It un-hides the image, then wraps the image in a new div element. As I mentioned in Step 3, this fixes the problem of reflections merging together. We also store a couple of bits of information about the slider in this div, using the data() method. These are slideNum (the slide’s index, starting from 1), and an initial value for oldLeftPos (the slide’s previous horizontal position before the current slide was changed — we use this later when positioning the slides). We add a simple click handler to each slide div so that when the user clicks the div, the slide is brought to the front. The handler sets oldCurrentSlide to the index of the current slide, then changes currentSlide to the index of the clicked slide and calls displayGallery() to update the slide positions. If the user resizes their browser window then it would be nice to update the gallery so that the slide images scale with the window height, and to keep the current slide in the centre. So we set our displayGallery() function as the window.resize handler. Now, whenever the user changes their window size, displayGallery() repositions and resizes the slides automatically. We use the jQuery Swipe plugin to let the user swipe left and right on a touch device to move between the slides. If the user swipes right-to-left then we call moveRight() to move to the next slide, and vice-versa. Swiping is currently pretty buggy on my iPhone 4 (not sure about iPad). The swipe events are firing on time, but there’s often a 2-3 second delay between swiping and the gallery updating. I suspect this is some sort of clash between the swipe action and CSS transitions. If anyone has ideas or a fix, please let me know and I’ll update the article! Next we create an event handler for the document’s keydown event. In this function, we detect if either the left or right arrow key was pressed. If it was then we call moveLeft() or moveRight() as required. Our last setup task is to activate the slider. We set the slider’s min and max attributes to 1 and the number of slides respectively, and set its value to currentSlide (1 by default). Then we attach a change event handler to the slider, so that when the user drags the slider to a new position, the current slide is set to the slider’s new value and the gallery is redrawn. Our gallery is now ready, so the last step of our init() function is to call displayGallery() to position and show the slides. displayGallery() is the meat of the script. Its job is to compute the positions and sizes of all the images in the gallery, then use CSS 3D transforms to position each image in 3D space, and set up transitions to move the images smoothly from their old to their new positions. This function also updates the slider position and the caption. // The slide is to the left of the current slide. // If the slide was previously to the right of the current slide, flip it immediately to the new angle. // The slide is to the right of the current slide. // If the slide was previously to the left of the current slide, flip it immediately to the new angle. // The slide is the current slide. // Position it in the horizontal centre of the gallery, facing forward. At the top of the function, we set up various variables that we’ll use throughout the function. pos will track the index of the slide we’re processing in the loop. galleryWidth and galleryCentre hold the width of the gallery and its horizontal centre respectively. windowHeight holds the current browser window height, which we use to compute slideHeight, the maximum allowed height of the slides in the gallery. Next we create 2 variables: step, which is the gap in pixels between each background slide, and currentSlidePadding, which is the horizontal gap between the foreground slide and the background slides on either side. We compute these based on the stepPercent and currentSlidePaddingPercent config variables, as well as the current window height. In a minute, we’ll be creating timeouts using setTimeout() to trigger the slide transitions after a short delay. This can cause problems if the user moves the gallery quickly, since they may move the gallery again before the timeouts have finished, resulting in unexpected movement of some of the slides. To stop this, we clear any previously-set timeouts here before repositioning the slides. Now we come to the core of the function. We use each() to loop through all the slide divs in the gallery, positioning them one by one. Within the loop, we first update the slide’s max-width and max-height properties to conform to the maximum allowed slide width/height (slideHeight). Our loop contains a big if ... else if ... else statement to handle the 3 types of slides: those on the left, those on the right, and the current slide in the middle. First we deal with slides on the left. We work out the slide’s horizontal position based on the centre of the window (galleryCentre), the current slide index, and the values of step and pos. We also adjust for the width of the slide, as well as the left and right padding around the current slide. Next, if we’re moving this slide from the right of the centre to the left then we have to do a bit of a trick. If we let the slide transition automatically from its old position and rotation, to its new position and rotation, then the slide will tend to intersect other slides as it goes — this can happen if the user jumps several slides forward or backward at once. This looks messy. To avoid this, we temporarily turn off transitions, then quickly flip the slide to its new rotation angle. We then use setTimeout() to do the main transition and horizontal transform 10 milliseconds later, once the slide has had a chance to flip. The transition and transforms itself are surprisingly easy to accomplish, since we can do it all using CSS. For the transition, we specify that we want the -webkit-transform property to transition smoothly over 0.8 seconds, and we supply a cubic bezier function of (0, 0, .001, 1), which you can read as: “Move very quickly at the start of the animation, then move more slowly towards the end”. We position and rotate the slide using the -webkit-transform property and 2 transform functions: translate3d(), which lets us specify an (x,y,z) position for the slide; and rotateY(), which rotates the slide around the Y axis. Since this is a slide in the background, we give it a negative z value of 100px to move it backwards “into” the page. We also add on a bit more to allow for the slide width; this helps to keep slides of different widths evenly spaced. To rotate the slide, we simply supply the bgRotateAngle config value (65 degrees by default) to rotateY(). Once we’ve done all that, we store the setTimeout ID in the flipTimeouts array so we can clear it later, and update the slide’s oldLeftPos value. The code after the else if deals with slides to the right of the centre. As you’d imagine, this code is pretty much the mirror image of the previous step. We compute its position to the right of the centre; flip it immediately if it was previously on the left; and update its 3D position and rotation using a 10-millisecond delay. Notice that we negate the value passed to rotateY() this time, since the slide needs to be flipped the other way round. The code after the else handles the current slide. This is very straightforward. We position the slide in the front and centre of the gallery, and rotate it to 0 degrees (facing forward). That’s the end of our enormo-loop! All the function needs to do now is set the slider to the new current slide value using the jQuery val() method, and set the caption’s text to the alt text of the current slide image. We retrieve this image from the list using the handy jQuery eq() method. No great surprises here. We check that we’re not currently showing the first (or last) slide, then update oldCurrentSlide, decrement (or increment) currentSlide, and update the slide positions by calling displayGallery(). fadeInLoadingMessage() uses the jQuery animate() method to fade the loading message up to its maximum opacity. Once the fade-in is complete, it triggers the fadeOutLoadingMessage() function. fadeOutLoadingMessage() does the reverse: it fades out the message, then calls fadeInLoadingMessage(). This sets up an animation loop that pulses the loading message continuously, until it is stopped by the calls to clearQueue() and stop() inside the init() function. All finished! Take a look at the end result again. And here’s another version with album covers instead of photos. Nice! Cover Flow is a pretty neat effect, and it would have been impossible to do smoothly within a browser until fairly recently. Thanks to WebKit’s excellent support for hardware-accelerated 3D transforms and transitions, we can now produce something pretty close to the native Cover Flow, all running within a browser. I hope you enjoyed reading this article, and found the techniques useful. As always, I’d love to hear your comments below. Have fun! Here’s a demo I set up that showcase how to obtain a Coverflow effect by relying only upon CSS properties. http://bit.ly/css_coverflow. Thanks to your article now I know how to add reflection below each card 🙂 Good work! @spx2: Cool! Don’t forget you can wrap each image in a black-background (or white-background) div if you want to stop the background cards leaking through to the foreground cards. thanks @matt ! I’ve tried to do that but somehow it fails and removes the opacity of the image. Sure I’m missing something 🙂 thanks for the tip! I’m getting the delay you mentioned on my iPhone 4 – does anyone know what’s causing this? Would be perfect otherwise. Thanks! I expect this will improve as iOS (and iOS devices) evolve and get faster. If I find any workaround in the meantime, I’ll post here! how can i add a action to the center image? @jecht: Modify the anonymous ‘#gallery div’ click handler function defined inside init(). If the clicked div isn’t the current slide, jump to that slide as normal. However, if it is the current slide, do whatever action you want to do. However, when I add many photos (I have hundreds), it works OK on the PC but dumps out both on the iPad and Android. @andrealing: Glad you like it! I expect you’re running into memory issues on your mobile devices, since these browsers have a lot less RAM available. The only workaround I can think of would be to dynamically load the images on an as-needed basis, then remove the image objects from memory when they’ve gone out of view. But this would of course involve more network traffic and slower response times as the user scrolls back and forth through the gallery.